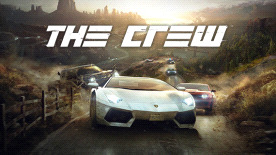 The Crew takes you and your friends on a reckless ride inside a massive, open world recreation of the United States that is brimming with exciting challenges. Generous in content and tailored for the connected generation, The Crew is the next-gen game that redefines a genre. Take part in a relentless ride to infiltrate and overtake the 510s, a gang grown around Detroit’s illegal street racing scene. Your plan? Grow your rep in the underground racing scene and sabotage their activities city by city, all across the United States. Maneuver through the bustling streets of New York City and Los Angeles, cruise down sunny Miami Beach, or trek through the breathtaking plateaus of Monument Valley. Each locale comes with its own set of surprises and driving challenges to master. On your journey, you will encounter other players on the road – all potentially worthy companions to crew up with, or future rivals to compete against. Set in a persistent, massive living world, The Crew is driving at its most exciting, varied, and open. NEVER DRIVE ALONE Jump in and out seamlessly and build your crew of four through bonding or intense rivalry. Whether your objective is to take down a convoy or to escape the police, achieving it with friends ensures a fresh experience each time you join in. A PLAYGROUND OF UNPRECEDENTED SCOPE AND VARIETY The entire United States is your driving playground – every road coast to coast and everything in between. Every type of terrain imaginable is yours to master – from downtown city streets to suburbs, hillsides, cornfields, canyons, desert dunes, or even racetracks. PREPARE FOR THE NEXT JOB An extensive tuning system combining depth and simplicity allows you to collect cosmetic and performance parts and customize your licensed cars according to your style and driving preferences. THE EXPERIENCE GOES ON, WHEREVER YOU ARE Continue the experience on smartphones, and on the web. Keep track of your friends’ performances and tinker with your ride before playing it live to set new records, or send your crew on jobs to gain more XP and parts. © 2014 Ubisoft Entertainment. All Rights Reserved. The Crew logo, Ubisoft, and the Ubisoft logo are trademarks of Ubisoft Entertainment in the US and/or other countries. Game contains VMProtect anti-piracy technology.